My eighth grade son is studying world history beginning with ancient times this year using Dr. Jim Stobaugh's Studies in World History Volume 1. There is so much to love about this easy-to-use curriculum! 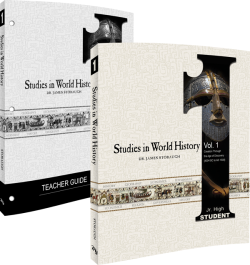 Studies in World History Volume 1 is part of a three-volume series written especially for junior high students. This history curriculum is a great transition curriculum, because it is designed for students to use independently, for the most part. Its format makes it a great introduction to independent study, and the lessons only take an average of twenty minutes per day to complete. There are 34 chapters divided into five lessons each, and the daily schedule is already designed for you in the teacher book. Beginning with ancient Mesopotamia, this biblical worldview curriculum covers the Creation through the Age of Discovery (4004 BC to AD 1500). The chapters open with a list of clear learning objectives, and then each lesson contains a short reading passage followed by discussion questions that can be answered in written form or orally. There are also ready-made tests and a complete answer key if you need them. In our homeschool, we traditionally use "living books" for our courses. However, with three kids to teach, spread over a wide age range (one high school/dual college enrollment, one middle school, and one elementary school), I needed a history curriculum this year that was not only simpler to use and easily portable, but that also appealed to my middle son's interests. He likes history, but he does not have a strong affinity for reading lots of books about history. He'd rather learn it in small increments and "get it done." That's where Studies in World History really fits for us. It is very straightforward, and with only one student book and one teacher book, it is simple to use. When we reach a topic that my son is more interested in, it is easy to supplement with hands-on activities, field trips, or further reading. For instance, we did cooking and craft projects related to the Ancient China chapter, such as trying calligraphy and cooking pot stickers.